Dan That's Good! – Say what now? Well now… It’s been a while. Wow, it has been a long time since I’ve written anything on here. To be honest, I actually forgot I had a WordPress account. I was just looking at my last post and thought, “Man, a lot has happened since then.” I doubt very many people know about this page, seeing as I don’t advertise it, but that’s ok. A lot of things have changed for me and my family. My motives, goals, and priorities are different now. I think when I was last posting on here, I was trying to break in to game journalism. As an introverted, inexperienced, non-grammatically correct individual, I’d say it was a LONG shot. I guess I was just full of hope and wanted to do something that I was truly passionate about. At any rate, life is good. My family and I aren’t rich and famous, but I have a job, we have food, and a place to live. Money is a bit tight, but we still manage to get some entertainment and fun things in. I feel like we’ve had a lot of help these past couple of years, and a lot of people willing to share what they have with us. While life is by no means perfect, we are in a MUCH better place that we were 2 years ago. Yeah, we are actually at the same rank, but she totally out-levels me. Kind of crazy… When I first got the game, she just enjoyed watching me play. The colors, the way I moved through the ink, the little sounds the inklings would make. One day she just decided she wanted to give it a try. She’s come a looooooong way. When she first started she couldn’t even move and shoot at the same time. Now here she is inking it up with some of the best of them! Swimming up walls, jumping from platforms, tossing splat bombs, calling in ink strikes, you name it! I thought it was really funny, one day I woke up for work (3:30 AM) and she was STILL playing. I walked in, half proud and half stunned, and said “Hey, shouldn’t this be the other way around? You know, me staying up all night playing games and you getting out of bed at 3:30 in the morning to tell me to stop?” Yeah, it’s been fun. The job I have now is a lot different from anything I’ve done before. It’s a bit boring at times, but it pays the bills, and I feel like perhaps I have a chance to move up in this company. Sometimes I hear coworkers complaining about being at this job, and I respect that. I mean, I’m one of the newest guys in the place, all these other people have seen and done more than I have by, well a lot in this job. Still, I always feel like a positive attitude can change nearly anything. Hope, you know? Having faith that even though things might not be so good now, they will get better, as long as you keep your eyes open for the opportunity to turn things around. If you aren’t looking and thinking positive, those moments can slip by completely unnoticed while you were busy wallowing in your self pity and wishful thinking. Anyways, I don’t know where I was going with all that. I guess I’m just trying to say, I’m grateful to have a job. To have income, and to provide for my family. Oooh! Also, I realized that I like hummus! It’s pretty tasty. It doesn’t get much more fierce than this! It’s been a while since I’ve picked up a game at launch. In fact, before Mario Kart 8, the last game I bought the day it released was Splinter Cell: Blacklist. 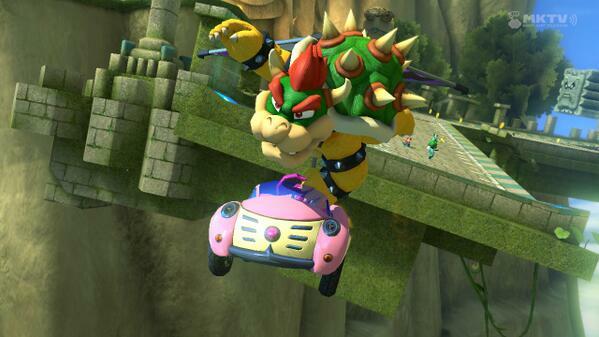 There’s something special about Mario Kart 8 though. It has this universal appeal that seems to really bring in gamers of all kinds together. For people who know my wife, you know that she does NOT like video games. The fact that I even own a Wii U was kind of a struggle and a huge compromise on her part. For her, growing up without video games was one of the best decisions her parents had made. It’s pretty much the opposite for me. Growing up WITH video games was(I feel) one of the best decisions my parents had made. 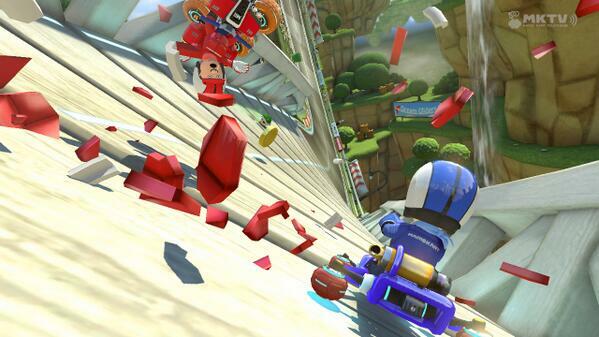 When I first got Mario Kart 8, I was trying desperately to organize a game with all my brothers. Kind of hard when we’re all in different time zones and have family responsibilities and all. The first few days I was only really able to connect with one brother or the other. Maybe my wife felt bad for me, but she actually asked if she could play. You have no idea how excited this made me. “Sure!” I replied and grabbed a controller for her. We played a few races and it was a lot of fun! Now every time she sees me playing Mario Kart 8, she asks to jump in for a game. Now, she’s not the best at Mario Kart but, every once in a while… She surprises me. Nintendo and Google, two names that generally I wouldn’t put together. They are both very different companies with different philosophies and goals. Though, recently I’ve been thinking of how well they could work together. For example, with Mario Kart 8, you have the option to link a Google account and share/upload your replays directly to YouTube. No fuss, no complications, just tap tap tap and it’s there for the world to see. So I’ve been thinking, what other Google services would work with Nintendo and it’s Wii U console?